The Essentials are essentials to the ethos of the school culture. They are designed to serve as key pillars to foster an innovative learning organizational culture which provides for clear pathways toward a P-20 pipeline. 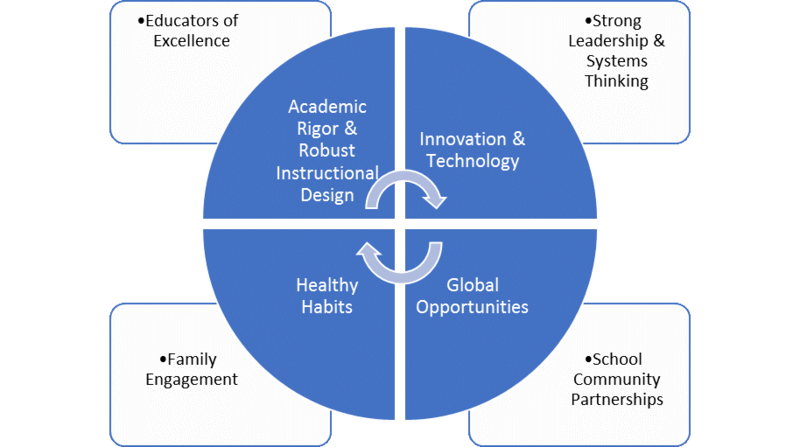 The Essentials are: Student Focus; Academic Rigor and Robust Instructional Design; Healthy Habits; Innovation & Technology; Educators of Excellence; Global Opportunities; Strong Leadership and Systems Thinking; Family Engagement; and School Community Partnerships. Student focus places students at the center of everything education. Supporting, engaging, and challenging students is at the core of all work. Students are valued and respected for who they are, where they come from, and where they want to go. All students are capable of learning, regardless of socioeconomic status, ethnicity, and race. Students are the most important citizens in the school community. All students will have a Personal Learning Plan that is data-driven, monitored frequently, and fluid to the needs of individuals. The principle of student focus is a primary to achieving the mission and vision of the school. Rigorous academics are key to increased student engagement and achievement. An innovative educational design includes a dynamic instructional design, high-quality, standards-based curriculum & environmental design, and intentional articulation of robust activities and learning experiences, opportunities for competency-based balance of formative and summative assessments, systematic analysis of and use of student data. The classroom culture supports academic rigor in a developmentally appropriate delivery system that tailors to the needs of individual students through based on systems analysis. The instructional model (IM) includes several key features that foster a school culture where student engagement and achievement are vital to promote global citizenship. The IM is designed to leverage technology and promote student agency through innovative practices. The model promotes learning through play, choice, game theory, individualized, differentiated and personalized learning, ability groups, blended learning curriculum, data-driven decision making, technology, social-emotional learning, cognitive and physical development, positive behavior and intervention supports, and family engagement opportunities. The instructional model supports a standards-drive center-based learning educational climate where accountability is embedded within the daily life of the classroom. Successful development and implementation of the instructional model and associated technology will serve as a catalyst to change the current approaches in education. Innovation is viewed as a catalyst for growth which is vital to a thriving school community. Technology is leveraged to provide engaging and powerful learning experiences, content, and assessments promoting increased achievement in complete, authentic, and meaningful ways. Technology provides opportunities for innovation in education that are vital to a connected global world. Equitable access to multiple digital formats and modern-day technology is essential for all students. Instilling healthy habits of the mind, body, and spirit are essential to student engagement and achievement. This includes incorporating social-emotional learning, character education, healthy nutrition and wellness, physical fitness, and spiritual opportunities to promote healthy habits. Pathways in leadership, entrepreneurship, sports, the arts, & performance opportunities are essential to students discovering and exhibiting their potential to as a global citizen. Educators are empowered to be change agents for students who foster student agency, health, wellness, and educational attainment. Educators are vital to the pulse of student success. Educators establish an effective and evidence-based delivery system of instruction and develop meaningful experiences for all children. Educators of excellence provide strong classroom leadership that drives results. Strong leadership is essential to a dynamic educational model. Leaders who facilitate a true learning organizations subscribes to relevant leadership models and theory necessary to operate a thriving school community. A strong leader promotes instructional and operational strengths, the change process, and is knowledgeable about and participates in current research. Six key principles outline family engagement: welcoming all families into the school community; communicating effectively; supporting student success; speaking up for every child; sharing power; and, collaborating with community. School community partnerships are essential to bridge common goals for the socialization and education of children to minimize problems and maximize results. The school serves as a hub in the community. Building major long-term partnerships requires vision, commitment, collaboration, communication and a cohesive plan where stakeholders reap the highest return on investment. Social impact potential extends beyond the walls of the classroom setting. The Innovative Educational Model is systematically designed to promote a high-quality program and positive student outcomes. Positive outcomes lead to a direct return on investment and sustained social impact. Investing in education improves the economy, strengthens the middle class, the workforce, and reduces the deficit. There is a direct correlation to reducing social spending with a return on investment of up 7-10% per annum up to a 16% ROI through better outcomes in education, health, social-ability, economic productivity, and reduced crime. The overarching outcomes are outlined for each essential pillar in the tables below based on Programs & Structures and Human Capitol.